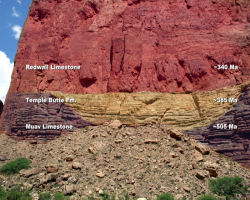 Steven Newton over at the National Center for Science Education’s (NCSE) ‘Science League of America’ blog is doing a series of posts that refute some of the common arguments creationists use about the Grand Canyon to prove their silly ideas. In the post answering the claim that the rocks in the Grand Canyon were put there by Noah’s Flood, Newton takes down the claim in a convincing manner. He shows the large stretch creationists have to make to push their idea that the rocks were left by the ‘great’ flood. This entry was posted in Science and tagged creationism, evolution, fossils, Grand Canyon, National Center for Science Education, Noah's Flood on January 6, 2014 by Doug.